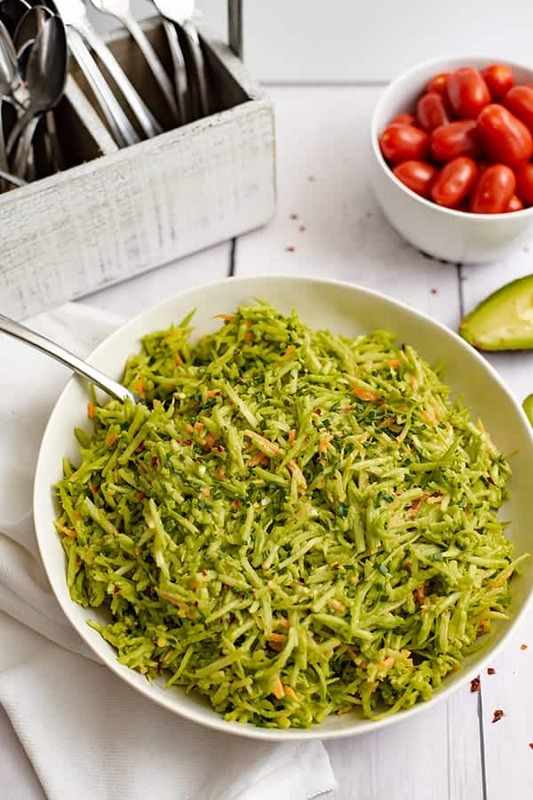 If you are looking for a simple 5 minute side dish that is perfect for any time of year, you have to make this broccoli slaw salad with avocado ranch dressing! This salad is not only simple to make, but it’s insanely delicious! 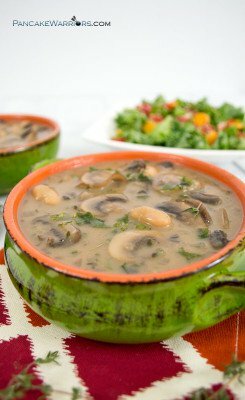 Vegan, gluten free, grain free, paleo, Whole30 and low carb! I always joke that the easiest way to get someone to eat their vegetables is to cover them in ranch dressing! At least that tends to work with kids! Which is why I’m surprised it took me this long to try the combination of broccoli slaw salad and avocado ranch dressing. But let me tell you the wait was worth it! 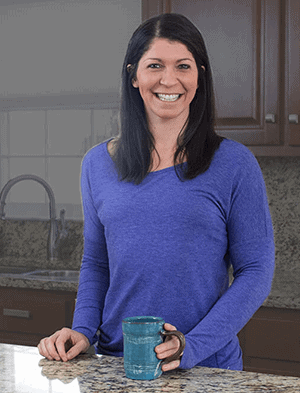 Working full time and trying to have a healthy home cooked meal on the table every night can be tough. Some nights, I just need something that is simple, quick and that I am crazy about eating! 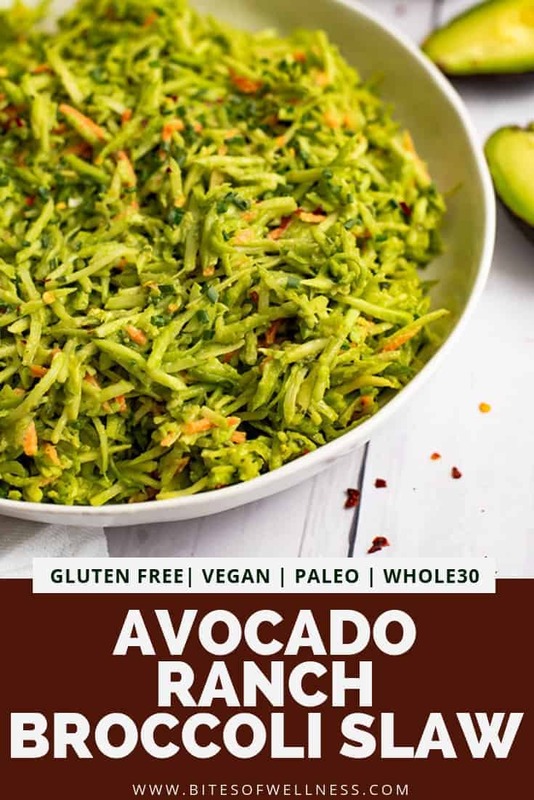 This recipe for avocado ranch dressing is amazing on pretty much any salad, but adding it to bag of pre-chopped broccoli slaw salad has got to be the easiest and most filling side dish ever! One of my clients who gave up dairy goes crazy for this simple avocado ranch dressing. She jokes with me that it’s the only reason she has apple cider vinegar in her house! I’m just glad that she was able to find a ranch dressing recipe that she loved that she could enjoy without any stomach pain! So one of the fun facts I learned was that broccoli slaw is actually a bi-product of the little broccoli florets you buy in the refrigerated section at the store. They take the broccoli stalks once the florets are removed and shave them down into broccoli slaw. 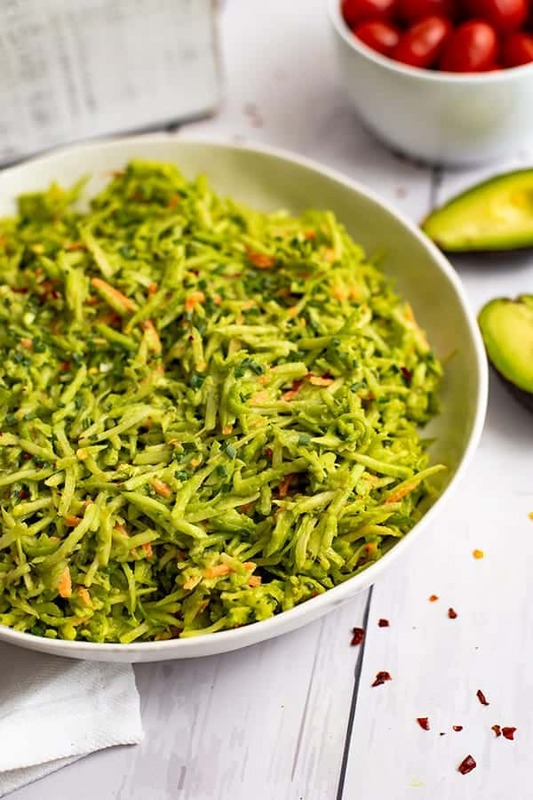 The add shredded carrots to the shredded broccoli stalk to make the broccoli slaw salad mix that you can buy at the store. The good news is that you can also make broccoli slaw at home with any unused broccoli stalks you may have! All you need is a food processor or a decent hand grater! Once the florets are removed, take the stalk and remove any tough spots (they are usually darker and almost woody) with a sharp knife. 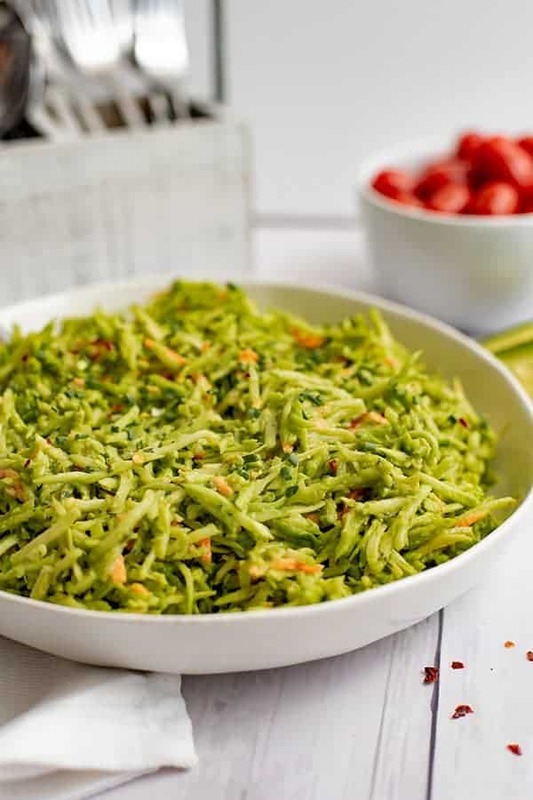 Once the stalk is all cleaned up, you just run it through the grater attachment on your food processor (affiliate link) or use a hand grater to shave it down into slaw. 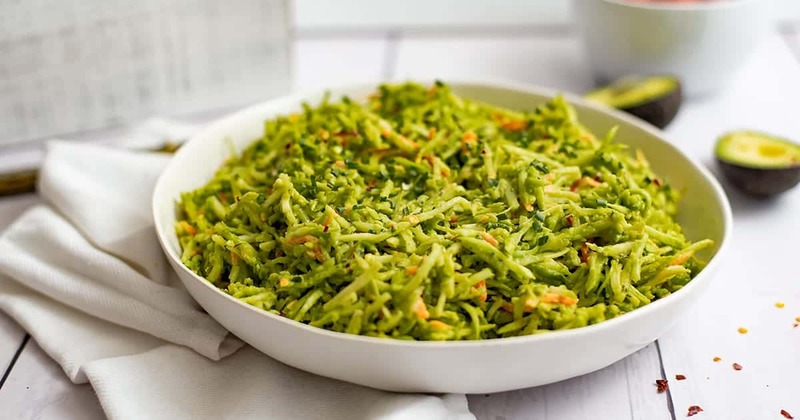 Broccoli slaw salad is the ideal side dish if you love to feel full after your meals! 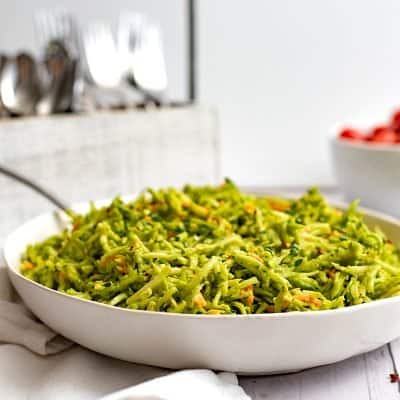 The broccoli slaw is a great way to get a large volume of food for very little calories. 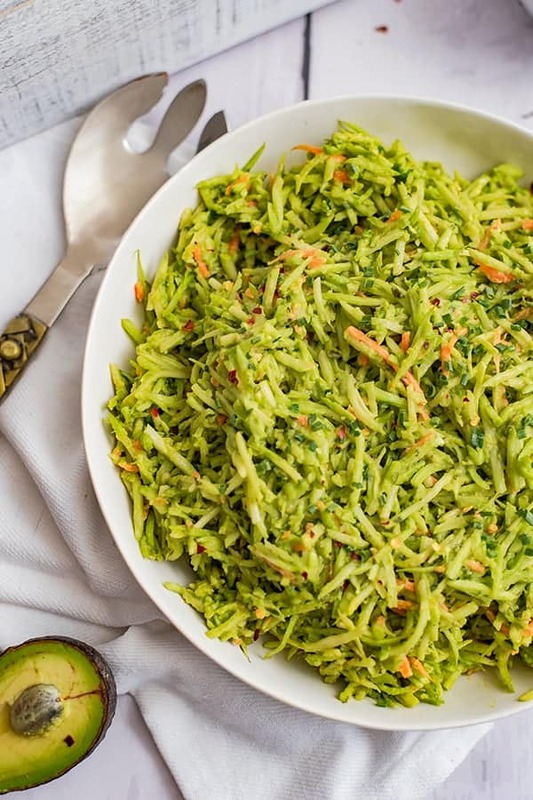 Broccoli slaw actually takes up a ton of room in your stomach, making you feel full on less calories! 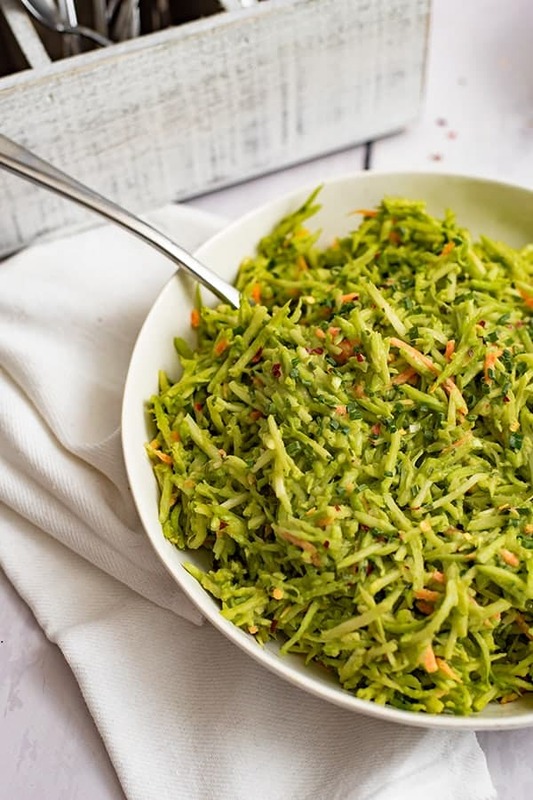 In fact, a cup of broccoli slaw has just 30 calories and 2 grams of fiber. Broccoli is in the family of cruciferous vegetables (with cauliflower, kale, spinach, brussels sprouts) which are known to be sulfur-rich foods. The sulfur in these veggies is what makes them so pungent when they cook! But it’s also what makes them powerhouses for your health! Sulfur as well as high levels of vitamin C make broccoli aids in your livers ability to detoxify! This simple broccoli slaw salad with avocado ranch dressing is an easy, filling side dish that can be prepared in just 5 minutes! 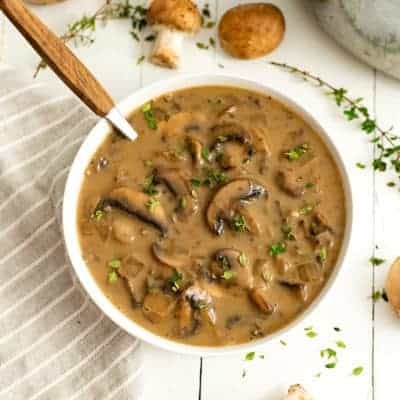 Low carb, gluten free, vegan, paleo and Whole30 friendly this is the perfect side dish for a weeknight meal or party! This sounds yummy I can’t wait to try this . Am so happy to know I can make my own broccoli slaw with the food processor?